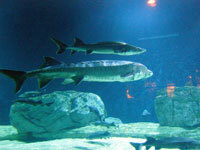 Located within the Beijing Zoo, the Beijing Aquarium is one of the world's largest inland aquariums. Its interactive exhibits provide an immersive experience that cannot fail to delight, such as an imaginative Amazon rainforest, complete with piranhas and pandas, as well as an exquisite shark aquarium where the brave can plunge into the tank with these infamous predators. Other attractions include whales and a number of rare or endangered fish. Families flock to see the dolphin shows at 11am and 3pm but, although these displays are a consistent favourite with kids, they are conducted in Chinese only. A boat from the canal south of the aquarium runs to the Summer Palace, giving visitors the opportunity to sightsee while en route to the attraction. The Beijing Aquarium offers a great mix of entertainment and education and is the perfect departure from more traditional cultural and historical tourism. For those travelling with children in Beijing, the aquarium is sure to delight the whole family. The fact that it is wonderful no matter what the weather also makes it a useful venue to have on the travel itinerary. Address: 18 Gaoliangqiao Byway, Haidian District. Opening times: 9am-5.30pm (summer); 10am-4.30pm (winter).